Dr Yaniv Roznai gives us an insight into his new book, Unconstitutional Constitutional Amendments (Oxford University Press, 2017). 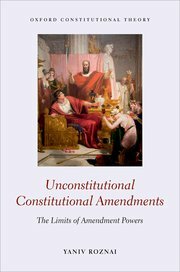 The book deals with the question: Can constitutional amendments be unconstitutional? The problem of ‘unconstitutional constitutional amendments’ has become one of the most widely debated issues in comparative constitutional theory, constitutional design, and constitutional adjudication. This book describes and analyses the increasing tendency in global constitutionalism to substantively limit formal changes to constitutions. The challenges of constitutional unamendability to constitutional theory becomes even more complex when constitutional courts enforce such limitations through substantive judicial review of amendments, often resulting in the declaration that these constitutional amendments are ‘unconstitutional’. Combining historical comparisons, constitutional theory, and a wide comparative study, the book aims to explain what the nature of amendment power is; what its limitations are; and what the role of constitutional courts is and should be when enforcing limitations on constitutional amendments. About a decade ago, back in 2008 and before coming to the London School of Economics to do my LLM, an Israeli Professor, Yoram Rabin, told me about a recent case in Turkey. This case declared a constitutional amendment unconstitutional for violating the principle of secularism, which was protected in the constitution as unamendable. I was fascinated by the idea that amendments that were enacted according to the amendment procedure could be declared ‘unconstitutional’ on the grounds that their content is at variance with the existing constitution. After all, is it not the purpose of amendments to change the existing content of the constitution? Thus, at first glance, the very idea of an ‘unconstitutional constitutional amendment’ seemed puzzling. There are many scholars who have influenced my work. Walter Murphy, whose excellent work has shaped my thinking about constitutional maintenance and change and also provided a model of how material from other countries can be used. The work of Carl Schmitt was also a major source of engagement. Schmitt is infamous for many reasons, but he asked important questions that touch upon the basis of the constitutional order. Contemporary scholars who have also greatly influenced me are Claude Klein and Martin Loughlin (whom I had the great honour and pleasure to be supervised by), both bringing historical and continental thinking to better understand constitutional theory. The main challenge derives from the book’s methodology which examines the doctrine of ‘unconstitutional constitutional amendments’ through multiple descriptions of the same constitutional phenomena across countries. As such, this book reviews various constitutional provisions limiting amendments (in worldwide constitutions from 1789 until 2016) and analyses a rich vein of jurisprudential writings and case-law. The book does not focus on any specific jurisdiction, but confronts the research from a more general perspective. Here lies the biggest challenge. As Kim Lane Scheppele cautioned me while spending time in Princeton, constitutions are not merely an “isolated island”, but must be understood in light of their surrounding culture, society and history. Therefore, aiming to focus on: “all constitutions in the world, past and present” might be too much to take on, and carries its risks. Kim was correct, of course, but I was willing to face this challenge in order to seek (and eventually demonstrate) comprehensive patterns of a constitutional behaviour (and I’m glad I did!). Academically, I want the book to serve as a starting point (a good starting point, I hope…) or a catalyst for a discussion on constitutional unamendability. I want scholars to engage with the book’s theoretical framework and use its comparative material such as the appendix of unamendable provisions. Practically, I hope that the book can guide constitution-drafters to use unamendable provisions carefully; guide constitution-amenders about the limits of their ability to formally revise the constitution; and finally to guide courts on how to properly use the extraordinary power of judicial review of constitutional amendments when enforcing constitutional unamendability. I’m working on several related projects, and I’m fortunate to have the opportunity to work with brilliant scholars, who have influenced my work and thinking. One such project is “doctrinal capture”, together with David Landau & Rosalind Dixon, which focuses on the deployment of the unconstitutional constitutional amendment doctrine in ways that misuse it for the advancement of agendas of powerful political actors that undermine liberal democratic constitutionalism. Other projects, together with Richard Albert, study “emergency unamendability” – the common limitation on amending constitutions during emergencies, and the relationship between limitations on constitutional amendment and religion/secularism. However, the primary project is a new book project, together with Gary Jeffrey Jacobsohn, on Constitutional Revolutions, which aims to provide and invite theoretical and comparative reflection on the concept of the constitutional revolution, an idea for which no canonical meaning exists. I am extremely excited about this project, mainly thanks to the partnership with Gary, who has been a great source of inspiration for me, and also because this book is a natural continuation of my recent book which focuses on constitutional revolutionary changes brought about through formal constitutional amendments.